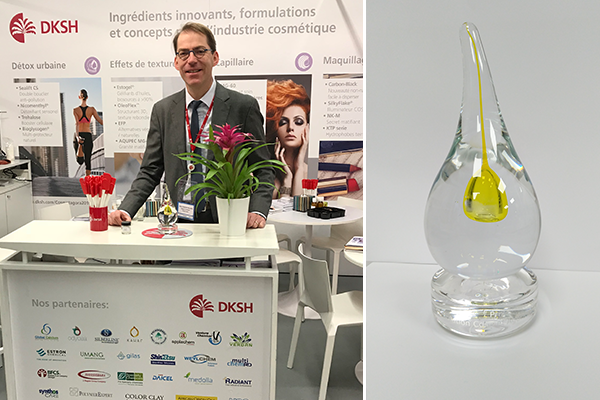 DKSH France has won the Silver Innovation Award at “Le Prix de la Formulation” during the eleventh edition of Cosmet’Agora 2019. Lyon, France, January 23, 2019 – DKSH’s Business Unit Performance Materials, a leading ingredients and specialty chemicals distributor, won the prestigious Silver Innovation Award for its unique formulation “Sili-gomme primer”, which was developed at DKSH’s state-of-the-art innovation center in Lyon. This is not DKSH’s first recognition at the formulation award, which was launched in 2014 to great success. In 2015, DKSH won an innovation award for its unique “Total Shield Cushion Formulation SPF 25” skin foundation. DKSH’s new 2019 winning formulation, chosen from around 70 submissions, is based on a thickening agent that can help formulators to develop new concepts with surprising textures. It was developed using a combination of innovative raw materials originating from DKSH’s valued international business partners, including Medolla, Nagase, Odycea, Schülke and Sumitomo Seika. DKSH Personal Care collaborates with its innovation and sourcing specialists around the world through its global network of twelve dedicated personal care innovation centers. DKSH’s innovation center in Lyon, established in 2009, this year celebrates ten years of unparalleled innovation and formulation development. Thanks to its experienced specialists and cutting-edge technology, the center provides a wide range of highly valued innovation and formulation support to DKSH France’s large personal care customer base. Services offered include: idea generation and conceptualization, new product development, product demonstration, technical training, trouble-shooting and tailor-made solutions. Visit DKSH at In-Cosmetics Global 2019, stand F31, at the Paris Expo Porte de Versailles on April 2-4 to discover a wide range of innovative ingredients and formulations for personal care applications.